Everything will come full circle in the fifth and final season of Fox’s Gotham. 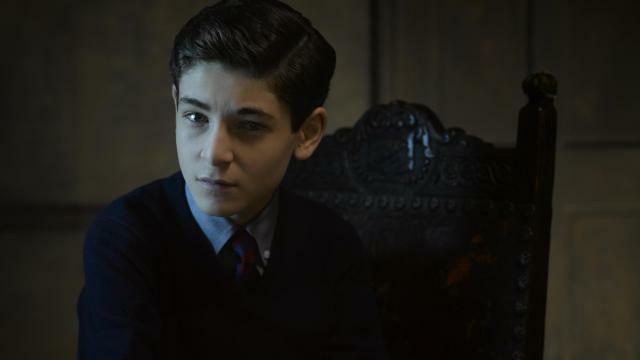 During today’s New York Comic-Con panel, we learned that the show’s last round of episodes will make further strides toward turning the teenaged Bruce Wayne (David Mazouz) into the world’s greatest detective. In fact, the series finale will jump forward 10 years. This means that the billionaire wunderkind will don the cape and cowl for the first time. We also have new confirmation that Shane West (Nikita), is set to play Bane. It was initially reported that the actor would be taking on the role of Eduardo Dorrance, an old friend of Jim Gordon (Benjamin McKenzie). Eduardo was supposed to be the leader of a team of elite soldiers with the ostensible goal of helping to restore order to the city. West’s Bane will be seen breaking Alfred (Sean Pertwee)’s back in Gotham‘s upcoming season. That’s a new twist on the famous splash page from the Knightfall comic, which was last brought to life in 2012’s The Dark Knight Rises. According to Deadline, other details that emerged about the new season during the panel include the return of several key villains from Gotham‘s past: Mr. Zsasz (Anthony Carrigan), Mad Hatter (Benedict Samuel), Scarecrow (David W. Thompson), and Hugo Strange (BD Wong). Robin Lord Taylor’s Penguin is also said to be getting a pet dog. We can only hope it won’t meet the same fate as the Cobblepot family cat at the beginning of Batman Returns. Fox has yet to make an official announcement about when the final season will begin airing, but rumors point to a March 15, 2019 premiere date. Only time will tell if this turns out to be true. You can watch a brand new trailer for the final season of Gotham below. Judging by the footage, the new season also seems to be influenced by the No Man’s Land comic storyline. Are you excited for Batman to make an appearance in the finale? Tell us what you think in the comments!